Increasing food security for the Galiano Island community means less reliance on food imported from the mainland and more reliance on local agriculture, implying that the farms on the island must be efficient and productive. The Cable Bay Farm (CBF) introduced new farming techniques 3 years ago to address these concerns, resulting in increased yield and efficiency. Our community partner from the Galiano Club Community Food Program is curious about these new techniques and their impact on the environment. This leads us to our research question focused on determining the environmental risks and benefits of the farming methods used at CBF: BioTelo biodegradable mulch, T-Tape Drip Irrigation, Biocontrol (beneficial nematodes and organic fertilizers), and transplants. Investigating the environmental impact of these methods will help the community to determine if they would like to move forward with replicating CBF’s farming approach onto other farms on Galiano Island and the Southern Gulf Islands, thus improving food security on the island. We used a mixed methods approach to conduct our research, including a meta-analysis of current studies and documentations on the environmental impacts of these farming methods. This was supplemented by key stakeholder interviews and observations obtained from site visits to CBF and the Galiano Island community. The results of our research did not find any major environmental risks of the farming methods used at Cable Bay Farm. However, research was limited to short-term studies, with no documented results past three years of use. Results are also seen to differ by geographic location and specific site conditions, making them difficult to extrapolate. Finally, there were no studies examining the combined environmental impact of all techniques used at CBF. So although results indicate that the environmental impact of these techniques is minimal, further site-specific studies, such as soil and watershed testing over a longer time scale, need to be done in order for a strong conclusion to be drawn. This report is a result of the research completed through the UBC course LFS 350, which allows students to work with partner communities throughout B.C. to address food and agriculture issues of concern. Our team consists of five Food, Nutrition and Health students, one Dietetics student, one Global Resource Systems student, and one applied animal biology student. Our community partner is Jane Wolverton, a representative of The Galiano Club Community Food Program. The Food Club Program are particularly concerned with food security in the Galiano community. The Galiano Island (G.I.) is one of the Southern Gulf Islands located between the coast of B.C. and Vancouver Island, in the Georgia Straight. The island has a population of about 1138 permanent residents, where 60% of islanders are over age 55 as of 2011. The average household income on G.I. is only 70% of what is seen in the rest of B.C., and 10% of the island’s population falls below low income (J. Wolverton, personal communication, November 20, 2014). In the 1960’s G.I. was self-sufficient, but since then the Island has grown to depend on shipments of food from the mainland, which are often subsidized in price (J. Wolverton, personal communication, September 24th, 2014). The Galiano Club Community Food Program wants to improve the food security on the island by working with the local farmers and community members to foster agricultural interest and build community through food (Galiano Club website, 2014). This report focuses on one of the Island’s farms specifically, Cable Bay Farm (CBF). Henny and Thomas Schnare own and operate this micro-farm. In 2011 they introduced a number of new farming techniques (refer to Appendix A). This has resulted in an increase in their yield by 20-25%, a decrease in irrigation water usage by 70%, and a huge decrease in labour expenditure (T. Schnare, personal communication, October 26, 2014). UBC students produced a report about CBF in 2011, before they had implemented these new farming techniques and it is evident that their farming model has changed drastically since then. Our community partner is interested in these techniques as they have the potential to improve food security on the Island if introduced on other local farms. However, she also has some concerns as to potential environmental impacts. This report will address this concern by assessing the environmental sustainability of these techniques: Biocontrol, T-tape irrigation, transplants, and BioTelo biodegradable mulch. We will also include a systems model of CBF to provide a visual representation of the farm while using these techniques (refer to Appendix B). To begin this project we first contacted our key stakeholders, Jane Wolverton, and Henny and Thomas Schnare, through email. We introduced ourselves and scheduled a site visit time. We also informed them that we would provide a weekly progress update every Wednesday via email. Prior to beginning our study, we reviewed the Tri-Council Policy Statement (TCPS) to help make us aware of any ethical concerns. In conducting our interviews, we needed to be ethical in our use of people’s personal opinions and feelings (see Appendix C). We conducted our research by using a mixed methods approach that consists of both qualitative and quantitative research methods (see Appendix D). We had originally proposed to research whether the farming methods used on CBF are environmentally and economically sustainable, and if these farming methods could be replicated on other Southern Gulf Islands. However, after consulting our LFS 350 Teaching Assistant and our community partner, we changed our focus to the environmental risks and benefits of the farming techniques used at CBF. We worked as a team throughout the project, dividing up work when necessary, but always going over everything as a group before finalizing decisions. Drip irrigation is a method of irrigation that uses specialized tubing or pipes and valves that allows water to drip slowly right at the plant roots. The tubing can be placed either on the surface or buried below, depending on the type of crop. Compared to other methods of irrigation, a well-designed drip-irrigation system drastically reduces water usage, as there is little water runoff or losses due to evaporation (Shock, 2013). In addition to water reduction, drip irrigation can increase the efficiency of fertilizer use, reducing the overall amount of components added to soils (Shock, 2013). In some instances, the use of drip irrigation has resulted in an increase in the nitrogen content of the soil (Halvorson et al., 2008). However, this is not always the case as a team in Poland at The Research Institute of Vegetable Crops found that the soil nitrogen content of carrot crops was reduced (Dysko et al., 2007). Beneficial nematodes are microscopic worms that can be used as biological control agents to suppress a variety of insect pests (Shapiro-Ilan et al., 2006). Aside from pest control, beneficial nematodes have an important role in nutrient cycling in the soil (Wright, 1998). The nematodes are capable of dispersing beneficial plant-growth-promoting bacteria that increase plant biomass, but may also spread plant pathogenic bacteria (Alphei et al., 1996). In many cases, the nematodes act as secondary decomposers that feed on primary detritivores, exerting a significantly positive effect on nutrient mineralization and crop yield (de Ruiter et al., 1993). CBF utilizes the natural species Sterinernema felitiae on potato and cabbage crops to protect them against wireworm damage, eliminating the need for chemical pesticides (T. Schnare, personal communication, Sept 12th, 2014). The application method used was low-pressure suction injection into mulched beds via an aqueous solution and the T-tape irrigation system in the evening. The suction injection method is not very well documented, but could potentially be a superior application method as it effectively decreases desiccation. The CBF uses three organic fertilizers, Bio-Fish 3-1-2, Bio-Firm Soil Conditioner and aged Compost from unwanted parts of crops (H. Schnare, personal correspondence, September 12, 2014). This has been added to the soil to allow microorganisms and worms to create an optimal environment for the growth of their crops. They also use compost consisting of a variety of unwanted vegetable parts. Compost fertilizers are an efficient and environmentally friendly way to enhance soil fertility and reduce waste by returning it back into the earth again (Bulluck et al, 2002). However, the use of fertilizers pose negative environmental risks to aquatic life. Fertilizers run off from fields can threaten freshwater and marine ecosystem with algal overgrowth, the subsequent decomposition of these organisms can rob oxygen from existing sea creatures and ultimately eliminate them from the habitat (Good and Beatty, 2011). Applying mulches is an important and commonly implemented practice on farms (Corbin et al., 2014; Li et al., 2014a) . Recently polyethylene plastic mulches have become popular (e.g. Corbin et al., 2014; Li et al., 2014b), however they create waste, require labour for removal, and introduced plastic into the environment (Razza & Innocenti, 2012). These issues brought about the development of biodegradable plastic mulches (Corbin et al., 2014; Li et al., 2014a). This paper examines the biodegradable mulch BioTelo. When considering the environmental effects of using BioTelo, it’s important to look at soil quality and biodegradability (Li et al., 2014a). Li et al. (2014a) examined the effects of biodegradable mulches on soil quality at 3 different locations, where one of the mulches examined was BioTelo. Soil quality was measured using SQI (soil quality index) which is based on five indicators of soil quality (see Table 1, Appendix E). 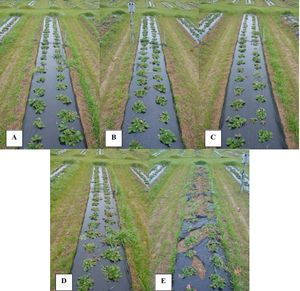 The results in Table 1 (Appendix E) revealed the biodegradable mulches only had a minor effect on SQI during 18 months. Results also differed for each location indicating that the specific site conditions play a role in how BioTelo affects soil quality. Other soil quality studies do not use BioTelo specifically, but we can also look at their results to provide insight. For example, Kapanen et al. (2008) buried biodegradable mulches for a year, then did ecotoxicity test on the soil. They found no evidence of ecotoxicity in the soil, and no change in the diversity of ammonia-oxidizing bacteria. Moreno & Moreno (2008) compared biodegradable mulches to plastic and found that overall, both affected the microbiological properties of the soil, but the biodegradable mulches had a less negative affect compared to the plastic mulches. The biodegradability of BioTelo was examined by Li et al. (2014b), in the same three locations where SQI was tested (see Table 2, Appendix E). The results varied by site, indicating that biodegradability depends on environmental conditions (see Table 2). Smith et al. (2008) found that BioTelo works as well as plastic mulches with the benefit that it biodegrades and the plastic does not (see Table 3 and Figure 1). Mojo (2012), stated that BioTelo follows the requirements of ASTM D5988-03 and D6400-04 . The ASTM (American Society for Testing and Materials) standard for biodegradable mulches requires that they must not exceed a period of 24 months to oxidize and biodegrade to at least 90%, and they must not leave harmful residues in the soil (ASTM International, 2013). CBF uses transplants where the only environmental concern is an increase in carbon dioxide emission. Transplants used at CBF are not grown at the farm (H. Schnare, personal communication, November 20th,2014). Instead, the farm sends its seeds to BEVO farm, a transplant company that locates in Langley, BC and receives transplants back from the company . The shipping process of sending seeds and transplants would result in increases in greenhouse gas emission as compared to planting seeds directly at the farm. The shipping process involves an hour drive minimal from Langley to the ferry and another one hour ferry trip to the island. A Ro-Ro ferry releases on average roughly 10g/m3/nautical mile carbon dioxide with 100% utilization of the ship (Kristensen, 2011). Since the distance between mainland Vancouver and G.I. is about 17 miles, the total amount of carbon dioxide release per ferry trip is 170 g/m3. However, since there is no information on the weight of transplants being transported available, the specific carbon dioxide emission caused by transporting transplants cannot be calculated. Our research into the environmental impact of the farming methods used at CBF highlighted a number of potential environmental risks and benefits. While the BioTelo mulch does not introduce plastic into the environment like other non-biodegradable mulches (Razza & Innocenti, 2012), it is unclear what the long term effects on the soil are. On CBF, use of BioTelo has been shown to improve the soil structure by adding fibre once it has decomposed (T. Schnare, Personal correspondence, October 26, 2014). Another study found that BioTelo decreased the SQI minimally over an 18 month period (Li et al., 2014a). However, results also showed BioTelo’s effect on SQI vary depending on specific conditions of the site. Overall, negative impact appears to be minimal, however this finding is limited as there are no studies that have looked at the impact of the BioTelo on the soil beyond 18 months. Additionally, this finding cannot be generalized as results varied by site and appear to be affected by environmental conditions. More research is needed to determine what the long-term impacts are. In their continued research by Li et al. (2014b), Lubbock has an “alkaline soil pH, high maximum soil temperature, and a relatively high abundance of fungi” present in the soil that contributed to the fastest and almost complete degradation of all three locations in 2 years. Lubbock also has clay loam soil texture that is similar to CBF’s soil which may suggest that BioTelo performs better with clay loam compared to silt loam in Knoxville and Mount Vernon. The bio-control methods used by CBF are less harmful than conventional pest and weed control methods, and they have made sure to select a species of beneficial nematode that is indigenous to the region. Since implementation of the biocontrol methods, the owners of CBF have not seen any negative environmental effects (T. Schnare, Personal correspondence, October 26, 2014). Using transplants speeds up the growing season, thus reducing the amount of water, fertilizer, and weed control needed compared to starting from seed. However, there is an increase in greenhouse gas emissions from the extra transportation required. The seeds are transported via vehicle and ferry to Langley and back again. The use of drip irrigation has been shown to decrease water losses (Hussain et al., 2010) and increase the efficiency of fertilizer use. At CBF, water use has been reduced by 70% since the implementation of their drip irrigation system. Naturally, our research project had limitations. The combination of methods used at CBF is unique and we were unable to find examples of other farms using all four methods we were investigating. In addition, the studies that focused on impacts to the soil were limited to 18 months (Li et al., 2014a). Our project only addressed the environmental aspect of sustainability. A more holistic view would have included social and economic factors. Unfortunately, our timing was limited to the school semester and the bulk of the time was dedicated to first learning how to conduct a research project. Finally, our collective educational backgrounds did not provide us with experience in environmental assessment and farming practices to draw from. With more time and expertise, we would have been able to conduct a more thorough and comprehensive analysis. As food security and sovereignty are important to the residents of G.I., we think that further investigation into the methods used at CBF is important, particularly since these methods provide many economic benefits (H. Schnare, personal communication, Sept 12th, 2014). Soil and watershed sampling on an annual basis would provide good insight into the long-term environmental impacts. Additionally, future LFS 350 students could build upon the research completed this term and calculate the carbon footprint of CBF. Investigation into the financial and social aspects of these farming methods would also be beneficial to the community. CBF’s methods are currently sustainable and effective, although the long-term environmental impacts are unknown, we predict the benefits overweigh the negative impacts in the long run. As a recommendation for further improvements, we feel more research can be done to develop a set of criteria to define what it means to be food secure for residents in the future. This would allow them to better assess initiatives and measure their success. Similarly, a set of criteria that defines the sustainability of their food system would be beneficial. These criteria could help guide G.I. in decision making regarding food policy. We thank UBC, LFS 350 teaching staff, Joshua, our community partner, Cable Bay Farm owners, and any other group that may have helped us. The following is summary of the four farming methods being used at Cable Bay Farm. Covers raised beds, which further decreases weeds, increases soil moisture and temperature, increases quality and yields, extends the growing season, and increases fertilizer use efficiency (e.g. Corbin et al., 2014; Li et al., 2014a). OMRI (Organic Materials Review Institute) - organic, GMO-free, and completely biodegradable (OMRI, 2014). Produced as granules made of a blend of starch and polycaprolactone-based co-polyester (Hayes et al., 2012). Used in various locations across North America (Corbin et al., 2014). Reduces cost by setting it to timers which allows farmers to water at non-peak hours, which reduces costs (Hanson et al., n.d.). May not be able to grow as much. In conjunction with the mulch, can grow in a shorter period of time. 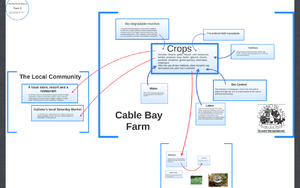 Screenshot of Systems Model for Cable Bay Farm on Galiano Island. Description of ethical consideration in conducting our research. A list of Qualitative and Quantitative Research Methods and the descriptions. Table 3. Comparison of durability between the four biodegradable mulches (0.6 mil BioTelo, 0.8 mil BioTelo, 1.0 mil Ecofilm, and 0.7 mil BioBag) at 15 days, 44 days, and 89 days. Results show that other than the BioBag, the biodegradable mulches perform as well as the polyethylene mulch (Smith et al., 2008). Figure 1. “Representative mulch films 89 days after application (Dec. 12, 2007): (A) 1.25 mil polyethylene, (B) 1.0 mil Ecofilm, (C) 0.8 mil BioTELO, (D) 0.6 mil BioTELO, and (E) 0.7 mil BioBag” (Smith et al., 2008). All materials show signs of weed emerging through parts of the mulch. Tables and figures for the results section. Table 1. Mean actual soil property values of five indicators of soil quality (β-glucosidase, microbial biomass carbon, pH, electrical conductivity, and total organic carbon) used to calculate soil quality index (SQI) after 6, 12, and 18 months field incubation at Knoxville, Lubbock and Mount Vernon in open field plots (n = 4) for control plots (no mulch applied) and BioTelo plots. (Li et al., 2014a). Table 2. Percentage of BioTelo mulch remaining at Knoxville, Lubbock, and Mount Vernon at 6 months, 12 months, 18 months, and 24 months in high tunnel and open field production system. The percentage was obtained by burying four mesh bags with equal amounts of BioTelo. They dug one bag up at each time interval and measured the percentage of mulch remaining (Li et al., 2014b). Transcript of interview with Thomas and Henny Schnare. Melanie: We are specifically interested in the biocontrol, t-tape, mulch, and the transplant. So we wanted to know why did you change to this model from the co-operative model that you guys were doing back in 2011. Thomas: The cooperative model was how we started, because we wanted to be part of the food program, which is the social aspect of the community. It worked very well, but I realized one day when they were coming up, it was based on a push strategy, and not a pull strategy. In other words, the food program, especially Jannett, was spending a huge amount of time and effort to get volunteers and people to come up and do the work and the rest of it. So she had to employ a push strategy. And it was, quite frankly, is quite inefficient. Because the time when she was looking for volunteers in the community to do it, was during the summer when everybody was busy. So I thought “Oh this isn’t working, too much of a push strategy.” So I thought, “Okay, we’ll change that, and be more efficient.” So I was doing my MBA, and of course, business students always look for what is the most efficient and productive, best way to create value? So I, literally, did a research project and found this equipment, the Rain-flo, and it’s very well-known equipment back East, but not out here. Jane: So how long does it take the BioTelo to degrade? Thomas: That depends, and we got an example of it. Let’s say you put your last crop in August, you got a 20-30 day crop. You pull it out and you plough it under you will see remnants of that in the field, by spring, if its had contacts with microbes and soil and moisture it will just turn into little corn cellulose in the field so if its got contact in the soil it disappears. Melanie: What do you use for pest control? Henny: When the crop is growing out of the ground the biggest advantage is using these rather special mulches is the fact of massive weed reduction which is why in my email i sent to you about biocontrol we consider the bio telo our premier first up wheat control item because each of the holes which is pressed into the biotelo with water, remember this is a huge water wheel with metal, on it are various sizes of spikes that are various distance between one another according to whatever crop you’re growing, and it pulls along the bed and makes holes, but only where the seedling it going in, so you pop your seedling in there and very soon will grow out, it will create its own little canopy, and it’ll have in and out of itself also constantly giving back in terms of compost at various times of the year. Melanie: Have you noticed any change in your soil composition since you have been using the bio telo? Thomas: No, the soil composition comes from our covered crops, and any compost we put in to it. Yes its supposed to be a little more, add a little more to the soil, I wouldn’t say. Our soil composition is better because we don’t need to tillage all the time, there is continuously alot of biological activity, so I’d say theres more biological activity. Melanie: What made you decide to go ahead with this model? Thomas: Our competitive advantage is how efficient it is. During the winter we got mud, and in the summer, we got hard terracotta soil! And so we live in a very dry area during the summer, from april to october, you get no water no rain. heres the other big reason, one is you can grow something out of the soil structure, that is a big game changer, all of a sudden you got a soil structure that is planted here, you could grow highly valuable crops using the system you could do with normal production, the second reason is the water. This system uses 7 thousand gallons, thats 75% less water,and get the 20-25% more yield of the crop production, what is there not to like about it? Jane: Are there other BioTelo-like products out there or this is the main one? Thomas: Here is where we got to be very careful, they are not OMRI certified, theres another thing we use, there is another one going out there that is growing 100 and 200 dollars a roll. And i looked at it and lawn was gonna get there, you gotta be very careful as you look at that, they call it oxy degenerator, but its not OMRI certified. OMRI stands for overall world organization of organic. if you get something OMRI tested or certified or used then its easier on the process that is certified by the OMRI for organic production. An oxy degenerative product it uses plastic between the fibers to hold it together. Melanie: When you guys switched over to these new methods, what type of challenges did you face? Thomas: Its very simple, its same in every business no matter what you do. Its the time, the effort, the perseverance in systemizing the process cause no else has done it. We don‘t have water shortage problem, we have a water storage problem, we get all of our water one time of the year, in the winter. so you don't store it for the summer. In the summer you can have a down pour and you can just dig down, its totally dry, its dust, it doesn't go down. Melanie: From start to finish, how long was that learning curve for you? Thomas: There is an initial learning curve that is very steep, and then it flattens out. That’s where most enterprises get a competitive advantage as you go through that learning curve first. Melanie: Did you guys see an increase in production, in the first season? Thomas: The first crop we put in were some beets, we took them to the market in 30 days, and they were 16 inches tall, holy smokes! Melanie: How does environmental sustainability fits into your current model? Melanie: and for the t-tape irrigation, we’re just doing some background research on it, some systems are permanent, and some you’d have to pull up after the harvest, which one are you using? Melanie: can you reuse them? Melanie: When it can’t be used anymore, is it recyclable? Melanie: And we know that power outages are common on the island, does that affect the pump for the irrigation? Melanie: What about waste management? What is your technique or plan for it? Thomas: We reduce it, reduction. The only ways we got is t-tape that can’t be reused is bundled up and goes into recycling. There’s one other, if we grow potatoes, you’d have to use plastic mulch. You can't grow potatoes using BioTelo, because ultraviolet light would go through and turn your potatoes green. So we have to send the plastics to recycling too. ↑ 2.0 2.1 Halvorson, A.D., M.E. Bartolo, C.A. Reule, and A. Berrada. (2008). Nitrogen effects on onion yield under drip and furrow irrigation. Agron. J. 100:1062–1069. ↑ 3.0 3.1 Dysko J., Kaniszewski S. (2007). Effect of drip irrigation, N-fertigation and cultivation methods on the yield and quality of carrot. Vegetable Crops Research Bulletin. 67: 25-33. ↑ 4.0 4.1 Shapiro-Ilan, D. I., Gouge, D. H., Piggott, S. J., & Fife, J. P. (2006). Application technology and environmental considerations for use of entomopathogenic nematodes in biological control. Biological Control, 124-133. ↑ 5.0 5.1 Wright, D. J. (1998). Respiratory physiology, nitrogen excretion and osmotic and ionic regulation. In R. N. Perry, & D. J. Wright (Eds. ), The Physiology and Biochemistry of Free-living and Plant-parasitic Nematodes (pp. 103-131). Wallingford: CAB International. ↑ Alphei, J., Bonkowski, M., & Scheu, S. (1996). Protozoa, Nematoda and Lumbricidae in the rhizosphere of Hordelymus europaeus (Poaceae): faunal interactions, response of microorganisms and effects on plant growth. Oecologia, 106, 111–126. ↑ de Ruiter, P.C., Moore, J.C., Zwart, K.B., Bouwman, L.A., Hassink, J., Bloim, B., de Vos, J.A., Marinissen, J.C.Y., Didden, W.A.M.,Lebbink, G., Brussaard, L. (1993). Simulation of nitrogen mineralization in the below-ground food webs of two winter wheat ﬁelds. Journal of Applied Ecology, 30, 95–106. ↑ Bulluck, L., Brosius, M., Evanylo, G., & Ristaino, J. (2002). Organic and synthetic fertility amendments influence soil microbial, physical and chemical properties on organic and conventional farms. Applied Soil Ecology, 147-160. ↑ 11.0 11.1 11.2 11.3 11.4 11.5 11.6 Li, C., Moore-Kucera, J., Lee, J., Corbin, A., Brodhagen, M., Miles, C., Inglis, D. (2014a). Effects of biodegradable mulch on soil quality. Applied Soil Ecology, 79, 59–69. ↑ 12.0 12.1 12.2 12.3 Li, C., Moore-Kucera, J., Leonas, K., Lee, J., Corbin, A., & Inglis, D. (2014b). Degradation of potentially biodegradable plastic mulch films at three diverse U.S. locations. Agroecology and Sustainable Food Systems, 38(8), 861-889. ↑ 13.0 13.1 Razza, F., & Innocenti, F. D. (2012). Bioplastics from renewable resources: the Benefits of biodegradability. Asia-Pacific Journal of Chemical Engineering, 7, S301-S309. ↑ Kapanen, A., Schettini, E., Vox, G., Itävaara, M. (2008). Performance and Environmental Impact of Biodegradable Films in Agriculture: A Field Study on Protected Cultivation. Journal of Polymers and the Environment, 16(2),109-122. ↑ 16.0 16.1 16.2 16.3 16.4 Smith, B. R., Deyton, D. E., & Sams, C. E. (2008). Biodegradable Films as an Alternative to Plastic Mulch in Strawberry Production. Crossville, TN: The Southern Region small fruit consortium. ↑ Mojo, S. A. (2012). §205.601 Biodegradable Mulch Film Made From Bioplastics Petition. New York, NY: Biodegradable Products Institute. ↑ 20.0 20.1 Hussain, K., Majeed, A., Nawaz, K., Afghan, S., Ali, K., Lin, F., Raza, G. (2010). Comparative study of subsurface drip irrigation and flood irrigation systems for quality and yield of sugarcane. African Journal of Agricultural Research, 5(22),3026-3034. ↑ Hayes, D. G., Dharmalingam, S., Wadsworth, L. C., Leonas, K. K., Miles, C., & Inglis, D. A. (2012)	. Biodegradable Agricultural Mulches Derived from Biopolymers. In Khemani,K. & Scholz, C. (Eds.) Degradable Polymers and Materials: Principles and Practice (2nd Edition) (pp. 201-223). Washington, DC: American Chemical Society. ↑ Koren, A., & Edelstein, M. (2004). Advantages and limitations of grated vegetable transplants in Israel. HortScience, 39(4), 873-873. This page was last edited on 30 November 2015, at 19:51.